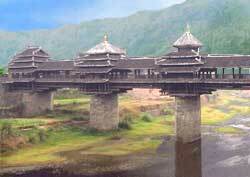 The pagoda topped village bridges in the Sanjiang region have striking architectural designs. The bridge of Chengyang village (see photo) is the most visually stimulating of them all. The bridges of Sanjiang were built by the Dong ethnic people, the largest population group then and now in the Sanjiang region. The Dongs used no nails or other metal fastening devices in constructing their traditional bridges (which demonstrates their architectural and carpentry skills). Dong riverside villagers need to construct the bridges because they typically reside and work on both banks. You cross the bridge inside its covered corridor. The underlying purpose of the roof is to shelter you from the wind and rain. As a bonus, the roof makes a splendid artistic statement. Because the covered bridges give protection from the wind and rain elements, the Dong people call the structures Wind and Rain bridges.